Home » Gift Registrations for the Holidays! Looking for the perfect gift for the beer lover/runner in your life? 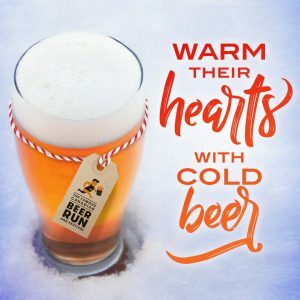 Maybe you’ve already registered for the Famous Canadian Beer Run (September 14, 2019) and you want a friend to join you. Our festive gift registrations are back! Simply select the gift registration button on the left side of our registration page, purchase the registration, download this 2019 Holiday Gift Certificate and fill it out to gift this holiday season!